Book News: George R.R. Martin Will Republish Children's Book From 1980 : The Two-Way Also: The queen of England's former press secretary is reportedly writing a book about the royal family; Sheila Heti interviews Joan Didion. Game of Thrones author George R.R. 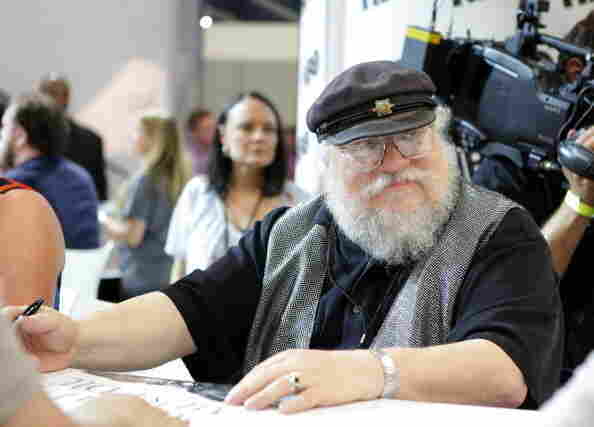 Martin signs autographs during the 2014 Comic-Con International Convention at the San Diego Convention Center. A 1980 children's story by George R.R. Martin, Game of Thrones author and wanton murderer of his own characters, will be re-released this October. Set in the world of his Song of Ice and Fire series, The Ice Dragon is a story about "a creature of legend and fear," according to Tor, the book's publisher. "When it flew overhead, it left in its wake desolate cold and frozen land." The new edition will be illustrated by the artist Luis Royo. Cesar Aira has a fairy tale in The New Yorker: "It all began when the genie came out of the Magic Milk bottle and asked me what I would prefer: to have a Picasso or to be Picasso." The queen of England's former press secretary, Dickie Arbiter, is reportedly writing a book about the royal family. Most untoward. Sheila Heti interviews Joan Didion for The Believer: "[Writing] forces you to think. It forces you to work the thing through. Nothing comes to us out of the blue, very easily, you know. So if you want to understand what you're thinking, you kind of have to work it through and write it. And the only way to work it through, for me, is to write it." The historian and journalist Rick Perlstein has been accused of plagiarizing parts of his new book, The Invisible Bridge: The Fall of Nixon and the Rise of Reagan. The New York Times reports: "The most serious accusations come from a fellow Reagan historian, Craig Shirley, who said that Mr. Perlstein plagiarized several passages from Mr. Shirley's 2004 book, Reagan's Revolution, and used Mr. Shirley's research numerous times without proper attribution. In two letters to Mr. Perlstein's publisher, Simon & Schuster, Mr. Shirley's lawyer, Chris Ashby, cited 19 instances of duplicated language and inadequate attribution, and demanded $25 million in damages, a public apology, revised digital editions and the destruction of all physical copies of the book. Mr. Shirley said he has since tallied close to 50 instances where his work was used without credit." Perlstein denies lifting from Shirley.